A climate policy comment published in the leading scientific journal Nature presents widely shared views about the ethics of Carbon Dioxide Removal (CDR) as a response to global warming (Lenzi et al, Weigh the ethics of plans to mop up carbon dioxide, Nature Comment, 20 September 2018). My view is that their approach is misconceived, and fails to place CDR, and by extension climate restoration, in a balanced and realistic ethical framework. This problem illustrates the strategic political challenges obstructing key programs supported by Healthy Climate Alliance. The lead authors of this paper are from the Mercator Institute, whose close involvement with IPCC analysis of possible 1.5° pathways illustrates the importance of their analysis. For the reasons discussed below, their assessment of the policy context is deficient, and their emphasis on CDR dangers is unbalanced. The unfortunate result is that following their recommendations would worsen the risks of dangerous warming. The policy context for debate about climate ethics should start from the recognition that failure to stop climate change poses high risks of catastrophe for human civilization and planetary biodiversity. Global warming is the primary planetary security threat over the next century, with climate stability highly fragile under the impact of strong expected carbon forcing. Every delay in formulating effective response worsens the impact of the sixth extinction and the risk of a permanent phase shift in global climate to a new hothouse stability, with grave risks of extinction, conflict and collapse. The moral imperative is to find practical ways to step back from this hothouse precipice. Neglecting CDR is far more dangerous than embracing it. Ethical analysis should recognise the urgency of research and development of CDR within the broader discussion of climate science and politics. The passionate moral cause underpinning all CDR advocacy is to save the world from unchecked warming. The ethical focus should be to determine whether that passion is matched by evidence, requiring expanded analysis and testing, not the barriers suggested by these authors. The big problem behind this discussion is that opponents of CDR believe that ramping up emission reduction could be an adequate response to climate change, even though the science flatly contradicts that dangerous false assumption. 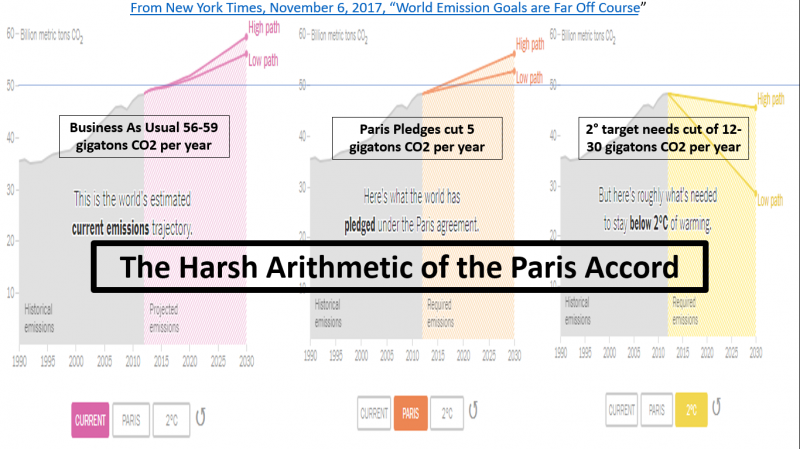 The New York Times study of the numbers showed that Paris Accord commitments if fully implemented would only slow the increase of CO2 and its equivalents by 10%, to an annual growth of about 54 GT in 2030. Putting all our eggs in the emission reduction basket is therefore a highly risky and ethically dubious strategy. Full implementation of current Paris commitments, even with the proposed ratchet mechanism, cannot stop dangerous warming without CDR. The strategic vision of emission reduction will not be enough for a number of reasons. Widespread opposition to emission reduction makes the decarbonisation model subject to strong political conflict, and in any case, emission reduction can only marginally slow the increase of warming, doing nothing to reverse the danger from accumulated emissions. By contrast, if CDR is given political leadership and resources, the world could potentially slow CO2 increase by more than 100% in the next decade, starting a practical planetary path back to climate stability and restoration, and helping to remove the partisan politics from climate change. Looking at climate action in the context of moral philosophy, two rival ethical frameworks can be considered. These frameworks focus respectively on consequences and on principles. The moral theory of consequentialism assesses the moral worth of an action by its results. This means when an action is demonstrated to have harmful consequences, with risks outweighing rewards, alternatives should be examined to define an optimal path. Ethical justification of CDR uses this consequentialist line of reasoning, examining a range of climate responses against likely outcomes and impacts, looking for ways to abate warming in the most safe, fast and economic way possible. By contrast, advocacy of emission reduction alone is more a principle-based morality. The organising moral principle in the thinking behind emission reduction is economic decarbonisation, the idea that if only the world could shift from fossil fuels to renewables then our climate problems could be solved. Unfortunately, the problem with this principled approach is that it treats results as secondary to the moral principle. The strategic primacy given to emission reduction in the thinking reflected by Lenzi et al and dominant influences in the UN system places decarbonisation as an overriding duty. This approach sees shifting away from fossil fuels as even more important than the goal of stabilising temperature. Decarbonisation should be viewed as a means to the end of climate stability, but has come to be viewed as an end in itself, thereby crowding out discussion of other strategies such as CDR, preventing robust analysis of the weaknesses of the decarbonisation strategy. The practical urgency of stopping climate change should cause us to debate such principles if evidence indicates they are likely to produce suboptimal consequences. In their Nature Comment, Lenzi et al make a welcome call for systematic evaluation by the climate assessment community and professional philosophers of the ethics of carbon removal methods. They rightly focus on human rights, sustainable development and environmental protection, but do not assess these important themes in a robust risk framework where all scenarios are given due weight. Such analysis of carbon removal methods in the context of climate policy pathways is exactly what is needed to develop a sound strategic vision of climate priorities, but it should be considered against all alternatives, including the ethics of continued failure to reduce emissions. The policy context requires broad public dialogue on the ethics of continuing to rely solely or even mainly on emissions reduction. This article does not discuss this ethical problem. If governments only provide lip service or worse to emission reduction, and do nothing to support CDR due to arguments such as this critique, then the world will face an existential problem over the next decade, with no effective response. In my own research field, ocean carbon sinks, the misconceived ethical framework of these authors lead to wrong conclusions. They assert that seeding the oceans with iron could undermine marine ecosystems, using unproven claims of environmental harm as a reason not to conduct field research, ignoring research on how expanding ocean carbon sinks would deliver ecological benefits. Sound ethical approaches need to weigh options, for example by recognising that ocean fertilization could help protect biodiversity in ways that outweigh any risks. In moral theory, risks must be weighed against rewards. In this case, the failure to weigh options means the claims of likely risk from ocean research unfortunately have the appearance of a political scare campaign, motivated only by perceived moral hazard to the principle of decarbonisation. Such claims need to be tested through science-based analysis. As the London Protocol stipulates, ocean climate research must be scientific and incremental, but the absence of field research over the last decade illustrates that the political signals have induced excessive caution on this topic. The dismissive attitude in this Nature Comment reflects a wider lack of engagement with calls to use the world ocean to reverse climate change. A coherent ethical critique would engage with how the scale, resources and energy of the world ocean could make it the primary location for CDR research. The main moral argument against CDR, termed a moral hazard, is that it could reduce pressure on governments to force decarbonisation of the economy. Lenzi et al use moral hazard language to describe CDR as “an unjust gamble that uses future generations as collateral”. Sadly, this claim is not a sound approach to moral philosophy. Putting the shoe on the other foot, the gamble that emissions reduction alone could deliver climate stability is a far worse bet than encouraging the diversity of approaches supported by CDR research. The authors allege risks in designing climate policy around unproven CDR technologies. They are in effect saying we now have all our eggs in the emission reduction basket, and should not diversify this strategic investment portfolio, despite the poor prospects of emission reduction. The realistic analysis is that CDR will be far easier to scale than emission reduction and has far greater potential to contribute to climate stability and deliver least cost abatement. A useful analogy here is a bathtub with the taps turned on full and the drainplug in place. Emission reduction partly turns down the taps while leaving the plug in, whereas CDR pulls the plug. On this model, emission reduction can only briefly delay overflow, while CDR can prevent flooding by draining the bath. The moral hazard critique of CDR is fundamentally confused. Lenzi et al display this confusion by citing IPCC scenarios that exclude relevant data and posit implausible options. With CDR, they say the target would be annual emissions of 32 gigatonnes of CO2 in 2030. Without CDR, they say CO2 emissions would “have to be reduced” by 40%, to 23 gigatonnes. This analysis is highly arbitrary. For a start, their target of 23 GT CO2 is less than half the UN estimate of global warming potentials arising from full implementation of Paris Accord commitments, which as noted above will result in 54 GT of CO2 equivalents in 2030. Focus only on CO2 ignores that other GHGs provide a third of all warming (IPCC Fig. 8.6). But even more worrying is the air of unreality in these scenarios. Their assertion that emissions would somehow “have to be reduced” lacks any mechanism for compulsion. What if major governments simply refuse to enforce emission reduction? The UN is impotent against nation states. A realistic ethical strategy is needed, which means CDR. The even more pointed problem with the moral hazard scenarios is that CDR could potentially deliver a net emission result far better than their 23 GT scenario if R&D is funded at scale. CDR methods such as iron salt aerosol could remove atmospheric methane and other potent GHGs, which now cause one third of all warming but are largely ignored under CO2 emission reduction analysis. Taking the full picture into account makes calls to delay CDR immoral. Failure to halt climate change would overwhelm these imagined ethical issues with CDR. As Klaus Lackner has argued, the real moral hazard is the reverse from the Mercator argument, arising instead from the perverse incentive to obstruct research into CDR. The false messages that CDR won’t be needed undermine effective climate action. The bottom line is that we have a real if difficult potential for good results from CDR versus an atmosphere of spin and denial within the official climate movement, as demonstrated by the recent disgraceful climate speech by UN Secretary General Gutierrez, who totally failed to mention CDR. The most urgent moral cause in climate politics today is to broker large investment in CDR as the best option to restore and stabilise the climate and give our grandchildren a liveable planet. If the Mercator authors open a conversation that enables that result, they will have delivered a great ethical service.